For fans of Unbroken and Ruta Sepetys. All Ida Mae Jones wants to do is fly. Her daddy was a pilot, and years after his death she feels closest to him when she's in the air. But as a young black woman in 1940s Louisiana, she knows the sky is off limits to her, until America enters World War II, and the Army forms the WASP-Women Airforce Service Pilots. Ida has a chance to fulfill her dream if she's willing to use her light skin to pass as a white girl. She wants to fly more than anything, but Ida soon learns that denying one's self and family is a heavy burden, and ultimately it's not what you do but who you are that's most important. Sherri L. Smith was born in Chicago, Illinois and spent most of her childhood reading books. She currently lives in Los Angeles, where she has worked in movies, animation, comic books and construction. Sherri’s first book, Lucy the Giant, was an American Library Association Best Book for Young Adults in 2003. The Dutch translation, Lucy XXL (Gottmer, 2005), was awarded an Honorable Mention at the 2005 De Gouden Zoen, or Golden Kiss, Awards for Children’s Literature in the Netherlands. Sherri’s novel, Sparrow, was chosen as a National Council for the Social Studies/Children’s Book Council Notable Social Studies Trade Book for Young People and is also a 2009 Louisiana Young Readers Choice Award Nominee. Upon the release of Hot, Sour, Salty, Sweet in February 2008, Sherri was featured as a spotlight author for The Brown Bookshelf's Black History Month celebration, 28 Days Later. 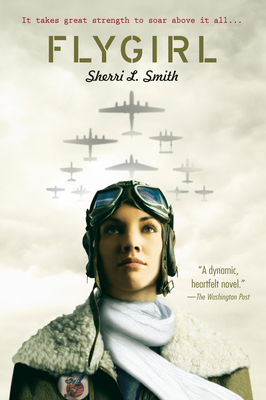 Flygirl, an historical YA novel set during World War II, is her fourth novel.